Sant'Angelo is on the Grand Canal, in a quiet corner of the otherwise busy San Marco district. If you're looking for a respite from the crowds but want to be close to the sights and shops around the Piazza San Marco, the Sant'Angelo neighborhood is a great place to stay. Two excellent hotels--NH Venezia Collection Palazzo Barocci (four stars) and Palazzo Sant'Angelo sul Canal Grande (four stars) are next to the boat station, facing the Grand Canal. For other hotels and B&Bs in the neighborhood, see the links below. 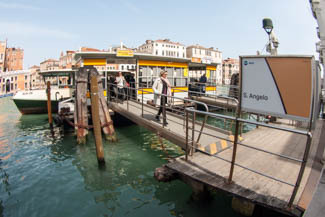 Note: Sant'Angelo does not have a ticket booth or vending machine, so here's what to do if you need to board a water bus without a valid ACTV ticket or Tourist Travel Card.